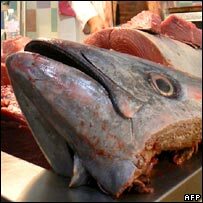 Catches of Atlantic bluefin tuna in the Mediterranean Sea will not be cut, despite evidence that fishermen caught more than they were allowed in 2007. The International Commission for the Conservation of Atlantic Tuna (Iccat) made the decision during its annual meeting, held this year in Turkey. Environment groups described the decision as a "shocking failure". EU fleets caught about 4,000 tonnes above their 2007 quotas; seven nations face legal action as as result. 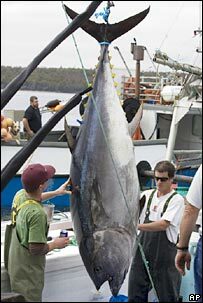 The US and Canadian governments, supported by environmental groups, proposed a moratorium on bluefin catches to allow stocks time to recover. Instead, Iccat allowed requests for small quota increases from a number of countries including Algeria, Libya, Morocco and Tunisia. These decisions brought ringing condemnation from environmental groups. "Iccat has proved itself to be entirely incompetent, and has failed again in its duty to sustainably manage our common marine resource," thundered WWF Mediterranean's head of fisheries Sergei Tudela. Greenpeace was equally dismissive. "The northern bluefin is on the road to extinction, and this meeting has not even reduced the speed limit," said the organisation's oceans campaigner for Spain, Sebastian Losada. For the most part, Iccat commissioners decided to stick with recommendations made at the organisation's 2006 meeting which initiated a "multi-annual recovery plan" for the Atlantic bluefin. The plan included cuts in quotas and in the length of fishing seasons that were substantially less radical than Iccat's scientific advisors had recommended. Iccat says there has not been enough time to determine whether the measures are working, and will review them at next year's annual meeting. "The plan is still going on - our recommendations were that there should be no revision of the plan," Iccat's executive director Driss Meski told BBC News. The plan included measures aimed at cutting down on illegal, unrestricted and unreported (IUU) fishing, which scientists believe has added as much as 50% to official catch quotas in recent years. Clearly the new emphasis on sticking to quotas has not had the desired impact, with the European Commission closing its bluefin fishery earlier in the year than planned and initiating legal action against seven EU member states for exceeding their quotas. Collectively, the EU came in about 4,000 tonnes over its quota of 16,779.55 tonnes. The EU will "repay" this excess by catching less than its quota in the three seasons from 2009. Delegates did agree to introduce a new system of tracking tuna from the net (or the hook) to the plate, which they hope will reduce illegal fishing. There is also to be a meeting in Japan early next year at which governments and companies involved can co-ordinate attempts to regulate bluefin catches more effectively.